MARBLE FALLS — The little girl didn’t want to enter the round pen by herself with the horse, which dwarfed her. Hannah Livers of Heart of Hope Healing, a Trauma-Focused Equine Assisted Psychotherapy program, didn’t want the girl to miss out on the experience, so she stepped into the pen with them. The child wasn’t participating in the therapy program; she was a member of the Boys & Girls Club of the Highland Lakes-Kingsland branch on a Spring Break outing. Livers and the girl walked side by side with the horse. Then, sensing it was time, Livers stopped. The girl and the horse kept going. In those few minutes, the child discovered something about herself. Livers knows that horses are more than just for riding; they can also help those suffering from trauma-related incidents. That’s where Heart of Hope Healing comes in. “There is a lot of research that shows how the relationship between humans and equines can help with trauma,” Livers said. Equine therapy is nothing new. People have been using it for years. What Livers is talking about goes further. “What I always thought was missing was the mental health aspect,” she said. 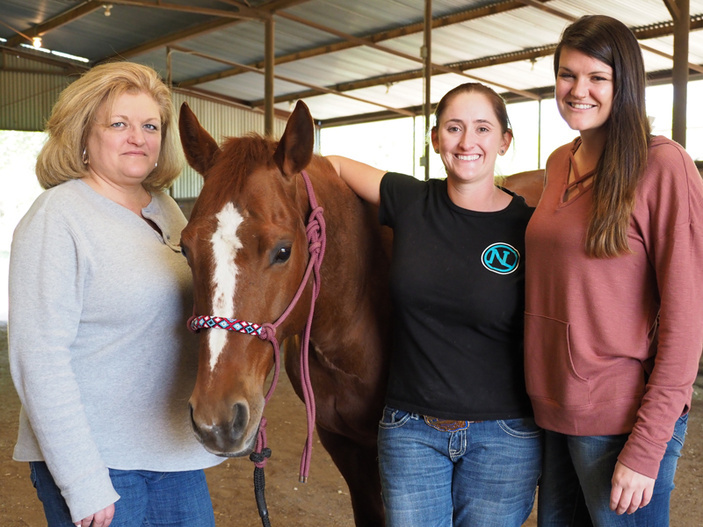 Livers and her mother, Christi Lundby, along with horse professionals Fallon Burger and Kaitlyn Hatfield bring together equine therapy and mental health in Heart of Hope Healing. Lundby has been a board-certified and licensed professional counselor for many years and is the owner of Heart of Hope Counseling and Mediation. Livers has a master’s degree in psychology counseling and is a licensed professional counselor intern. Heart of Hope Healing is a nonprofit that uses horses and mental health counseling to help those, particularly youths, who have undergone trauma in their lives. The idea of Heart of Hope Healing came to Livers in June 2017 when she was helping at the Phoenix Center’s Camp Phoenix, which also uses equine therapy. It was an “ah-ha” moment as Livers began to understand how horses and mental health counseling could help young people. Livers didn’t have the equine skills necessary to bring the two together in an effective manner, nor did Lundby. However, Livers didn’t let that stop her. She discovered Natural Lifemanship, which founded Trauma-Focused Equine Assisted Psychotherapy (TF-EAP) and teaches the science and art of connection. A month after her Camp Phoenix experience, Livers enrolled in Natural Lifemanship training at Spirit Reins in Liberty Hill. Soon after going through the training, she established Heart of Hope Healing and registered it as a nonprofit. Lundby also went through the training as the two began to see the real value of TF-EAP. It’s not about riding horses — the bulk of TF-EAP is groundwork conducted in a round pen. It’s to establish a connection between human and horse. In the way TF-EAP works, the horse wants to be there, wants this relationship with its human partner. The beauty of this therapy is how it relates to life outside of the pen. “They can take that equine relationship, and take it into their human relationships,” Livers said. In the beginning stages of Heart of Hope Healing, Livers had a problem: She didn’t have any horses or a training facility. And those things aren’t cheap. Luckily, Livers’s friend Fallon Burger of Burger Performance Horses on Price Ranch was there to help. When Burger heard about Livers’s vision, she jumped on board, offering her facility and horses. Hatfield, a second horse professional, also joined the program. Lundby pointed out that, during any equine-based therapy session through Heart of Hope Healing, there are always a mental health professional and an equine professional present. One monitors the client; the other the horse. Since forming in August 2017, Heart of Hope Healing’s only session was the Spring Break program for Boys & Girls Club members, but this was about giving the kids a good time, not therapy or counseling. Lundby and Livers didn’t throw the doors open last summer to welcome clients because they want to provide low-cost or, in some cases, no-cost services to children and families. They’ve spent the past nine months getting everything in place and raising funds. The organization recently received funding to provide services to high-risk youths and those in the juvenile justice system. Lundby said 93 percent of youths in the juvenile justice system have suffered some type of trauma in their lives, with the average young offender experiencing six different traumatic events. Heart of Hope Healing doesn’t just work with the child. In the end, it’s about healing those in the community who are hurting. Often, these are the most vulnerable and least able to afford the costs of counseling and therapy. As a young nonprofit, Heart of Hope Healing is working to get its name out there. On Saturday, April 14, the organization is hosting its free Spring Fling from 1-4 p.m. at the facility, 6414 CR 120 northwest of Marble Falls. The event will serve as an introduction to Heart of Hope Healing’s services and offer demonstrations, children’s activities, a silent auction, a prize giveaway, and food trucks. At least one founder of Natural Lifemanship, Bettina Shultz-Jobe, has committed to attend with another, Tim Jobe, a strong possibility. “It’s a chance to come out and see who we are, what we do, and what this is all about,” Livers said. Go to hthree.org, visit Heart of Hope Healing’s Facebook page, or call (325) 704-0535 for more information.